“More with less” is a phrase which accurately and succinctly defines the way of life in Cuba for artists and musicians as well as for the general population. The economic blockade imposed on the island by the United States almost sixty years ago has made imports difficult and expensive, and Cuba mostly reliant on its limited internal production of food and any other household goods. The much romanticised 1950s American cars on the streets of Havana are a mere example of the lack of import of basic goods such as car parts and new cars, and the impaired purchasing power amongst the Cuban population, which has to achieve more outcome with less resources. In a similar way, musicians are required to achieve much with few resources. With limited number of new and second hand instruments available, only few recording studios, production and distribution companies, spaces to practice and finances, Cuban musicians have to achieve high standards of performance for local and international consumption. Mas con Menos (MCM) are only a band of seven musicians; yet, they have to create atmosphere and musical complexity of the 14-15 piece salsa, tímba and son bands of Cuba. Even reggaetón groups have taken up the traditional Cuban full-band structure of around 14 members, transforming the international genre into a more Cuban style. MCM achieved their goal at their first concert act Havana’s most modern arts venue Fábrica de Arte Cubano (FAC). The hall was filled with Cubans and foreigners dancing and cheering to the rhythms of the band, from the more reggaetón-rap fusion of Mantecado dedicate to the rhythm of Cuba’s traditional instrument the clave, to the MCM version of Compay Segundo’s composition of Chan Chan. Trombone player Eduardo Sandoval performed a jazz solo, including personal compositions, following a smooth jazz saxophone piece by Yuniet Lombida. With three percussionists, three brass players and a piano, the band created a wholesome atmosphere, sharing music, dance and singing, as MCM are a bit of everything. The group achieved not only more with less but also lived up to the saying that less is more. The musicians of MCM met as part of the crew of popular Cuban singer Isaac Delgado who came to support the band at FAC. The founder of the project is Eduardo Ramos, currently one of the leading percussionists in Cuba. Overall MCM are three percussionists (Eduardo Ramos, Jose Julian Pino and Edgar Martinez), three brass players, including saxophone (and flute), trumpet (Reinaldo Zamora) and trombone (Hansel Sanchez), and a piano (Yusef Diaz). Is MCM an Afro-Cuban percussion-based project? 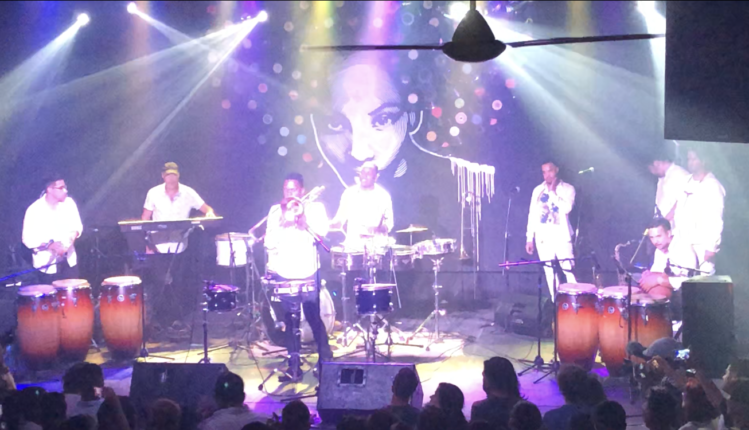 With rhythms varying from smooth jazz to reggaetón and rap, MCM are establishing a new genre of Cuban music, one that has no name and organised parameters yet, but one that audiences are enjoying listening and dancing to, whether live or on a CD. As Ramos shares out, the band does a bit of everything – music, dancing and singing; the brass players drum, percussionists sing and dance. He thinks beyond limits and stereotypes of Cuban music and Afro-Cuban percussion and to innovation, one that reflects individual creative and pursuits in an environment of limited resources. The band were all dressed in white. Beyond traditional Afro-Cuban clothing, this expresses to me a manner of simplicity and humility, which the band brings on stage. Their great talent and hard work invested in the project are not a cause for arrogance, but for celebration, for expressing personalities and ambitions. Ramos does not find reasons for limiting creativity and feeding stereotypes of Cuban music and musicians. While paying his respects to the past and the great musicians of Cuba such as Changuito and Tata Güines, and congueros Miguel “Angá” Diaz and Puerto Rican Giovanni Hidalgo, the music of MCM is not about the past, it is about the present moment, the future; it is for Cuba and the rest of the world. There is more to Cuban music than the Buena Vista Social Club project, there is more than salsa, timba and son; and it cannot be simplified under the label of fusion. Creative development and innovation in Cuba continue besides limited resources. Music creation and the evolution of sound are achieved with the little available. Breaking away from stereotypes of Afro-Cuban music and percussion rhythms, MCM are bringing a new genre to life, one that does not need to be defined yet, but enjoyed. The band are expressing their own experience of life and music, of being contemporary musicians in Cuba through this innovative project that celebrates various aspects of their personalities and musical skills together. I had seen MCM rehearse at Cuba’s national recording company EGREM few months earlier for the recording of Mantecado. The studio was alive with music and dancing. Indeed with little available MCM are creating more, which also seems to be the way forward for musicians and Cuba in general, managing sufficiently with the limited that is available. While many aspects of Cuban society are still based in the past, the island’s music is living in the present and driving Cuba forward to the future, internationalising the country and continuously innovating.